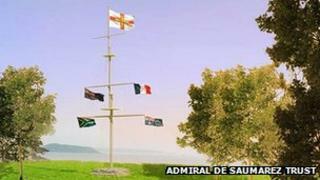 A replica of a ship's mast will be erected at Guernsey's Delancey Park as a tribute to Admiral Lord James de Saumarez, if planners approve. The Admiral de Saumarez Trust has submitted plans for a 100ft (30m) steel copy of the mizzen mast of HMS Victory, which he commanded from 1808-12. The structure would be temporary, as the trust hopes to raise enough money to erect a stone obelisk at the site. A stone monument to Saumarez stood in the park from 1877 until 1943. This original memorial was unveiled on 2 August 1878, on the 80th anniversary of the Battle of the Nile, at which Saumarez was second in command to Admiral Horatio Nelson. The granite obelisk was destroyed by occupying German forces during World War II, leaving only two courses of granite. The proposed mast would be set into this remaining base. The Environment Department has previously approved plans for a new obelisk, made from light-absorbing glass encased within stainless steel, perforated with decorative patterns to emulate the constellations. Alex Rodger, one of the trustees, said: "It's wrong to say we have revised [the plans]. "The approval we've got for the stainless steel obelisk remains and continues to be a long-term objective for the trust." Mr Rodger said he hoped the temporary mast would attract further funding for the obelisk. Recreating a memorial to the admiral is one of many projects the trust has planned in order to regenerate the St Sampson park, which was first opened to the public in 1897. A new playground was opened in July, with £120,000 of new play equipment. Further projects include outdoor gym equipment, an archaeological display at the Neolithic gallery grave that stands within the 16-acre park, and a kitchen garden. Mr Rodger said he hoped these projects could be completed by the spring. The foreign secretary brands as "ridiculous" a UN panel's ruling that Julian Assange be allowed to go free, but the Wikileaks founder demands the decision be respected. Who joined Adele in telling Trump to turn it off? Can technology help build a perfect country? Think you have skills to be next star of Six Nations? What is the most beautiful garden photo of the year?